It’s raining every other day in Accra now which, of course, is perfect for lounging and reading, especially over the weekends. However, the country’s on-going energy woes translates into a never ending electricity load- shedding exercise. Reading at night on some days is simply out of the question. I should really fix my generator because load-shedding will likely continue as the story of 2013 in Ghana, barring a jaw-dropping Supreme Court judgement in the ongoing presidential election petition. 2. Reading – I’m reading Bessie Head’s When Rain Cloud Gather. I’m thinking about a week-long focus on Head’s work, during the week of July 6, in celebration of her birthday. I still have One Day I Will Write About This Place and my usual pack of short story anthologies. Amos Tutuola’s The Palm-Wine Drinkard is the WPG Book Club’s book of the month and I plan on participating. 3. Iris on Books is hosting a Dutch Lit Fortnight from 17th June to 30th June. 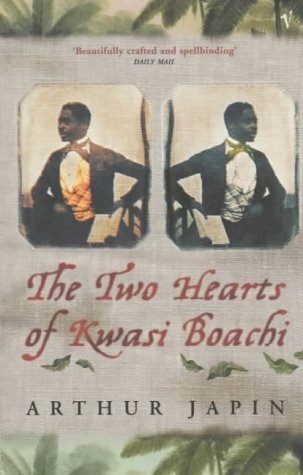 I plan on reading The Two Hearts of Kwasi Boachi by Arthur Japin, which will be discussed on 29th June. Check out Iris’ plans if you are interested in participating. 4. The birthdays of Efua Sutherland and Octavia Butler are both in June so there’ll be features on them later in the month. 5. Book reviews are coming soon. I think that’s it for me. What are your reading plans for this June? All the best with your plans, Kinna. Reading for the Classics Challenge and some books sent over by authors for reviews. Long overdue. Wish you the very best with your readings. Also started reading the Palmwine Drinkard. And yes I feel lucky to be born in the same month as Sutherland. And Kinna, keep up with the good work. I enjoy reading your posts. You have a way of smuggling in some political things. By the way, load-shedding is no excuse for not reading ooo. I just completed reading Tales of Tenderness and Power by Bessie Head. That’s an excellent anthology. Last week or two I bought three of her books – the one already mentioned, When the Rain Clouds Gather, and The Cardinals. I wanted to get to understand her more. Her writings are deep and carry a certain power and punch. Already, I’ve read A Question of Power; Maru; and A Woman Alone. All I will say is, Bessie belongs to the Realism group of writers. I may pick up When the Rain Clouds Gather or might postpone it to another time. Great. I am especially pleased to see you plan to write about Bessie Head. She is someone I have been eager to read. I will see what I can find of hers.